Calculating takes on a whole new meaning in this fast paced math counting game! Fun for all ages. Everyone knows 1 + 1 = 2. But did you know Dot + Line = 6? 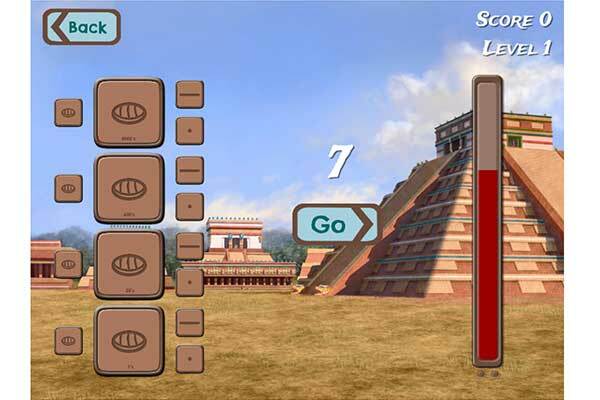 Use the ancient Maya’s remarkable number system to translate numbers, but watch out for the timer! 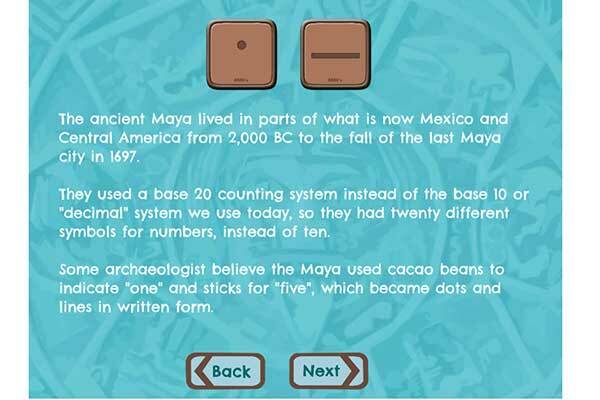 Build math skills and learn the Maya’s unique base 20 number system! In this fast-paced game, players take their math skills to the next level. Using the ancient civilization’s revolutionary numerals—shell, dot, and line— translate randomly generated numbers in this competitive mental-math challenge. 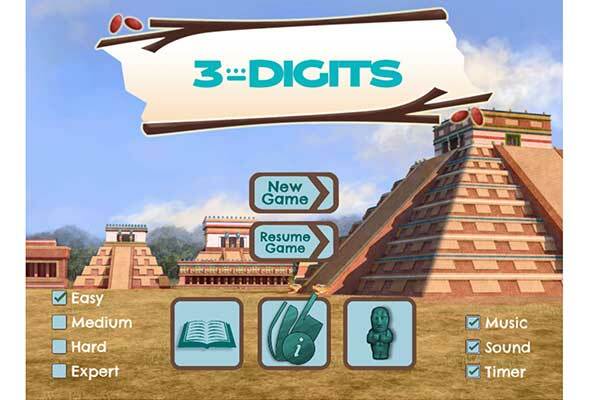 As players learn fascinating facts about the ancient Maya, they also practice this unique number system. Because of this intertwining of elements, 3 Digits becomes an immersive, engaging and cross-curricular learning experience. Players must use their understanding of properties of operations with multi-digit arithmetic, the significance of place-value, and number system bases in this fast-paced challenge. Math has never been so much fun! Support for desktop play as an HTML 5 games recently added. Play it in your math classroom on your Chromebook. The Maya lived in what is now Central America, where their descendants still live today. The Maya culture covered a large region, including the modern countries of Guatemala, El Salvador, Honduras, Belize and a large portion of southern Mexico. From before the 16th century BC to the Spanish conquest in the 17th century AD, the Maya built huge cities in the jungles of Central America. The Maya boasted complex political organizations, a unique artistic style, and an impressive grasp of mathematics, astronomy and writing. Maya achievements in math, astronomy, recording time, technology and commerce rivaled and often surpassed the great civilizations of the West. Best known for their calendar, the Maya created so much more. Maya kings ruled vast regions from huge cities filled with monumental architecture. Pyramid temples rose over 200ft, towering above the jungle canopy. Tens of thousands of people lived and worked in the cities: court attendants, artisans, farmers, priests, and more. Merchants and traders sold and traded their products in large, well-organized markets. Astronomers recorded their studies of stars and planets in books that were archived in large palace libraries and engineers laid out cities with remarkable precision. There are currently over 7 million Maya in Central America, including roughly half the populations of Guatemala and Belize. 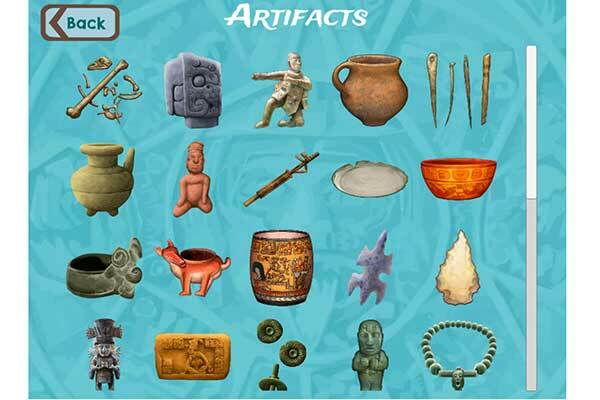 Maya culture has been preserved through oral and written histories, dances and rituals. In many villages, social organization, agricultural practices, technology and beliefs about family life and the agricultural cycle have not changed significantly in hundreds of years. Recently schools have begun teaching Maya history in the Mayan language, an important step in preserving the heritage of this remarkable culture. The Maya had a remarkably detailed understanding of math. We kind of take it for granted that you can add or multiply huge numbers and do complicated engineering calculations to build roller coasters and space stations, but did you know that none of that would be possible if we didn’t understand about place values? You learned about ones and tens and hundreds places in math, right? Well that’s a pretty advanced concept that very few ancient cultures understood. But the Maya did! Maya astronomers figured out that to track the orbits of planets and predict eclipses and such, they needed a symbol to represent zero. So, like our decimal system, Maya math was based on place values. Maya math used a base 20 system with place values of 1s, 20s, 400s, 8000s, and so on. Symbols were used to represent zero, one and five: a shell, a dot and a bar. Numbers were made using a combination of these three symbols placed in vertical columns where each row was a place value. 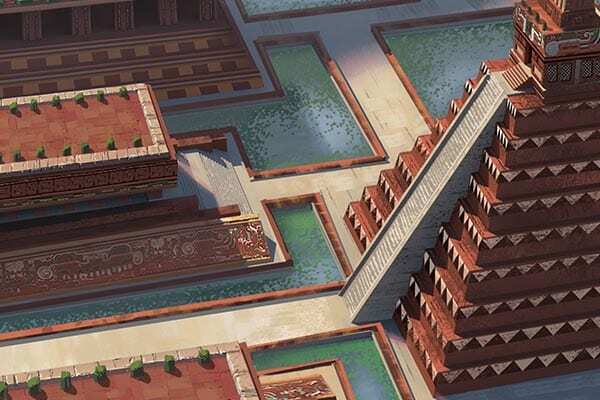 Using this system with the all important zero symbol, Maya architects built massive structures, engineers planned the orientation of buildings with extreme precision and astronomers predicted eclipses and other celestial events.